Thanks. Every time I play KoW, I like it more. Seems to be a good set of rules for small or large games and hits all the things I like to make a game feel like a fantasy battle. Tilean soldier, at your service. You have a stock of beautiful pieces . Where do you expose them? Do you have a big showcase? Can you show us the photos? That army shot looks beautiful! 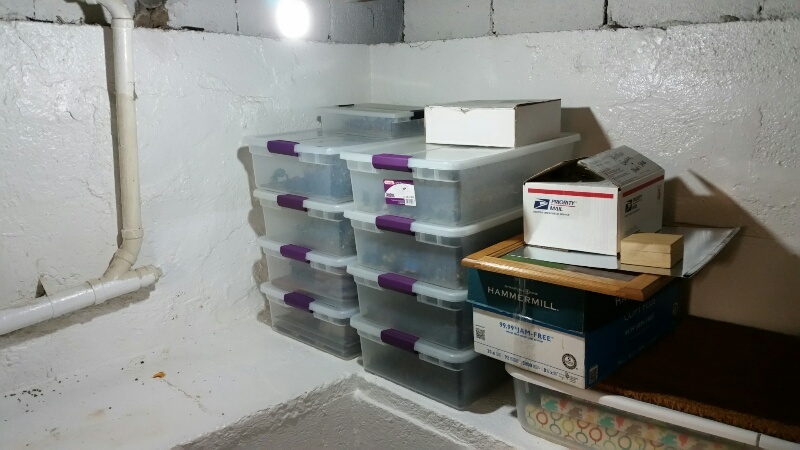 Unfortunately, this is where the miniatures spend most of their time. Most of mine is the same at the moment. All I have out is a shoebox or two of unpainted stuff to work on. Everything else is away in storage. 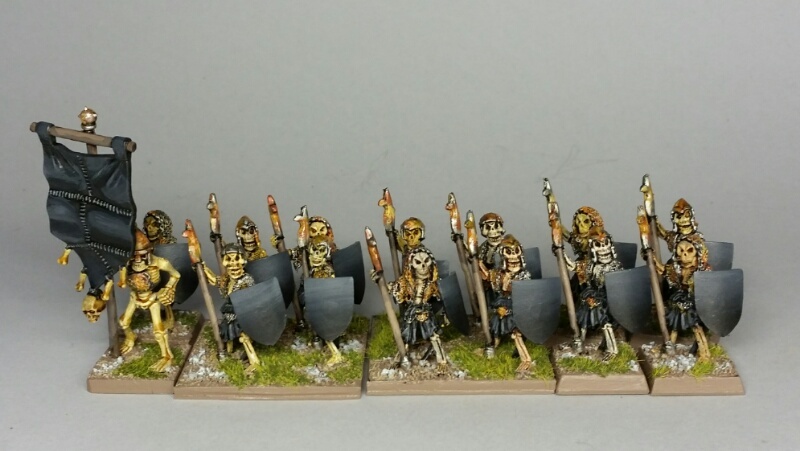 And some WIP skeletons, about 80% done so far. Awesome cauldron Guy. Mr death looks like he’s waving to his mom - hey! You’re next, yes you! The cauldron looks interesting in those colors. Finished the skeletons. I started them early, in November, but completed in Deadcember. Close enough for me. Mostly old Citadel, a few Black Tree Design mixed in. Thanks. They I think are pretty cool sculpts, too! 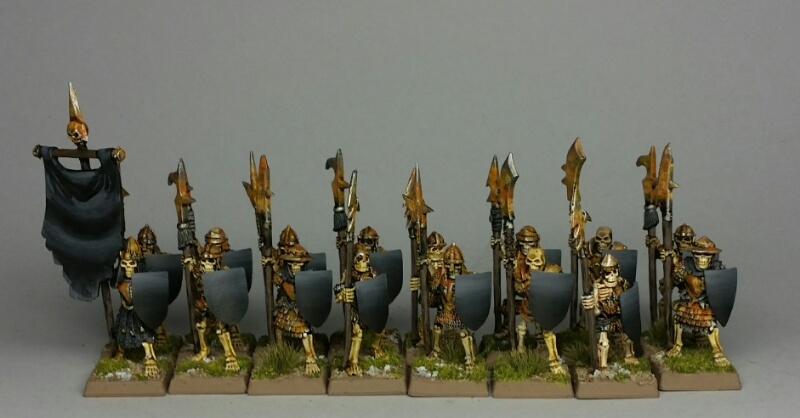 Done with the latest batch of the second gen. Citadel skeletons. I ended up putting two on individual bases, since I had some trouble fitting 4 on every 40mm base. So I end up with more "footprint" than planned, the regiments will still look full, and I have a start on my "singles." So it's a win/win/win. This version of the plastic skeletons are big fellas which take up a lot of space. There are only a few in my army and they make the Mantic ones look a bit wimpy. Do like the colour of your Orcs, very LOR's and grubby as an orc should be. 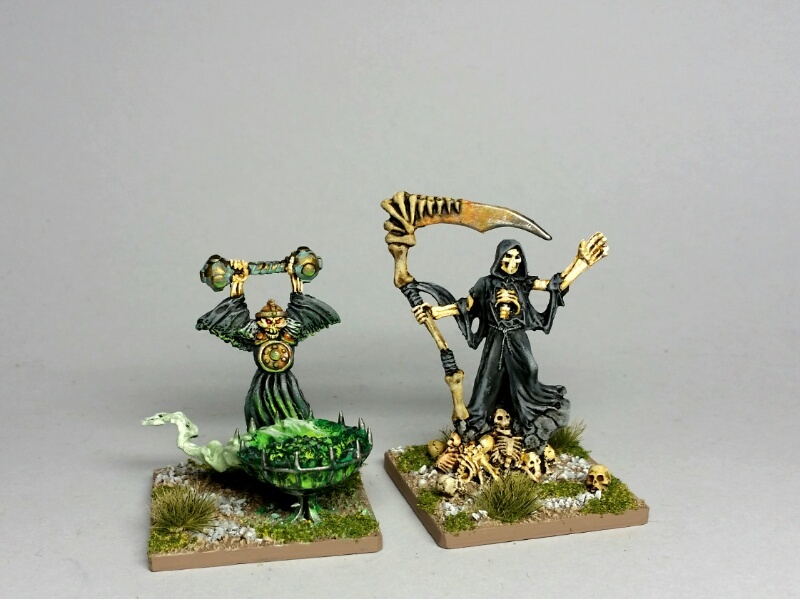 Colours on that cauldron are stunning, any chance on sharing how you painted it ? Haha, well most of my regiments lately have been skeletons, so it's easy. It's not like I've been painting puffy, slashy, colorful Empire troops lately. These plastics are very well done, they're just so big. If they were scaled down just a little bit (like their predecessors) they'd be some of my favorite minis! A lot of spontaneous paint-as-I-go. I started with a ligh-ish green base on the whole thing, then gave it a second coat and started wet-blending a very light green, up to white at the tail end of the fumes. Then I went back with a combination of wet blending and layering (wet layering?) with increasingly darker greens, and mixing in a little black at the end. Then some black & dark metallic on the frame of the brazier. 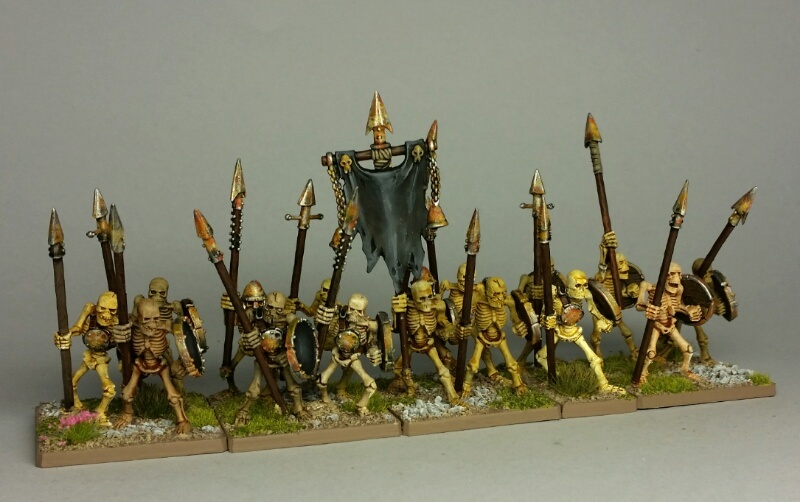 My last planned Deadcember project is some more non-human skeletons to bump a smaller unit up to a larger horde, but for whatever reason I'm just not feeling it right now. 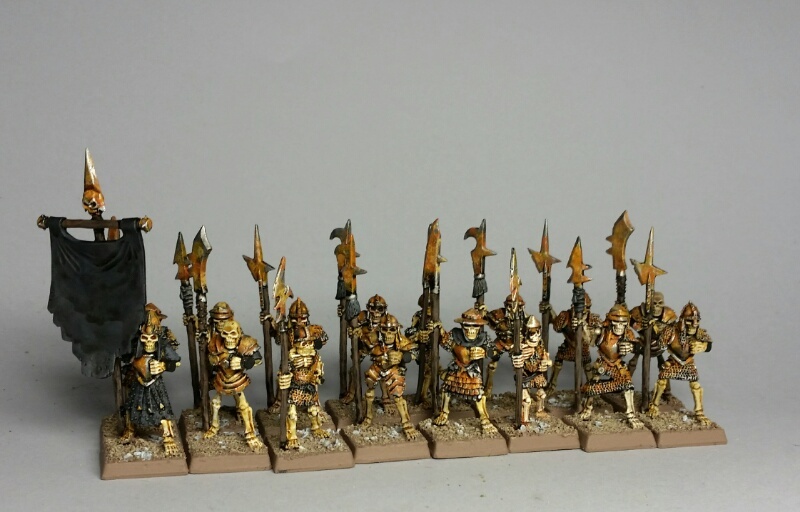 In fact, I'm not really in the mood to paint up much of the undead I already have. I think the major factor in play is that I don't really feel like cleaning & assembling a bunch of minis. Everything requires a bunch of pre-painting work, and I'm just not in the mood. I'm sort of wishing I had a big model to work on, or something(s) already prepped and ready to paint. Or a pile or rank & file already prepped. I'm completely in painting mode! Only half way through Deadcember, though. Even though I'm prep-impaired, I'm still motivated to get a big heaping pile of undead done by the end of the month, so maybe I just need a day or two to relax & think about what to tackle next. 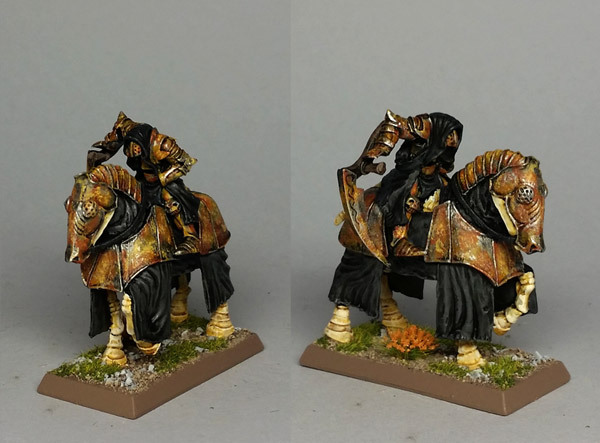 Absolutely stunning armour on that horse! They're finished black? Or that's the gray + black ink undercoat we've seen a couple of times before? 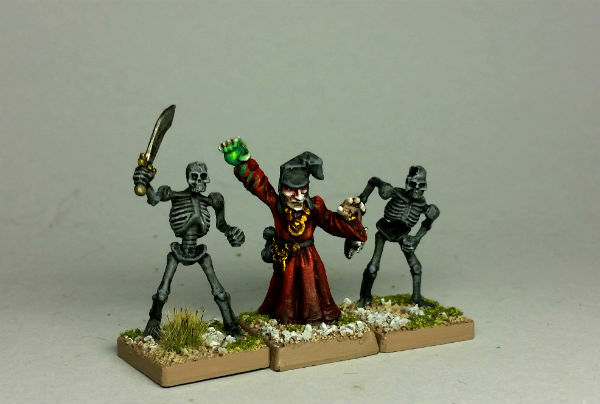 Where is the Necromancer figure from? Never seen it. Very characterful and superbly painted! It comes from some ideas I have about how I would increase the psychological factor of the undead if I were a living necromancer. I've got some other ideas, but I've been wanting to do this one for quite some time. It is a contrast with the Army of the Dead that I've been working on, which is stripped of human trappings, adornment, emotion, etc. I did a dark grey, then black wash, then some drybrushing & edge highlighting to bring out some of the detail a little better. The necro is an old Citadel wizard. http://www.solegends.com/citc/c002wizards/ His left hand was mangled somehow, so I cut it off and replaced it with a plastic archer hand from the Mordheim/militia sprue. Thanks. I just had an early morning laugh our loud moment at the Red Skeleton joke. Just wondering, will we be treated to the inverse situation to the Undeadish - black skeletons with brightly coloured shields and banners?